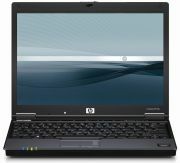 HP Compaq’s new ultraportable, the HP Compaq 2510p, is now shipping, starting at $1549 (lower than initially expected). It has a 12.1-inch widescreen display, and does include an internal optical drive (DVD dual-layer Multi-burner). Very surprising for a machine that weighs just under three pounds (and one of the most affordable in this class and weight). – Utilizes Intel Core 2 Duo Ultra Low Voltage CPUs (U7500 1.06GHz and U7500 1.20GHz). Thanks to JamesT for emailing this in.